Live at The Forum Los Angeles, CA, June 2, 1974. Excellent SBD stereo. Back then even in $ingapore, there was nothing but derision written in reviews by locals who listened to Grand Funk Railroad albums. They had stepped on the toes of music fans who grew up on blues rock. But the Funk were raw rock and rollers. You can hear that on Footstomping Music here. While Grand Funk could play to large audiences, rock critics still put them down. Didn't Lester Bangs? 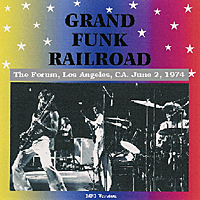 In an attempt to establish cred, Grand Funk Railroad shortened their name to Grand Funk, removed their sevengli Terry Knight, and added keyboard player Craig Frost. They also jettisoned their raw sound in favour of a produced album. Todd Rundgren was hired and actually produced two hits for the group, "We're An American Band" (from We're An American Band) and "The Loco-Motion" (from Shinin' On). The latter was a pop cover, something of a first. They got nowhere with rock critics and elitist music fans. What could not be denied was their appeal especially live. 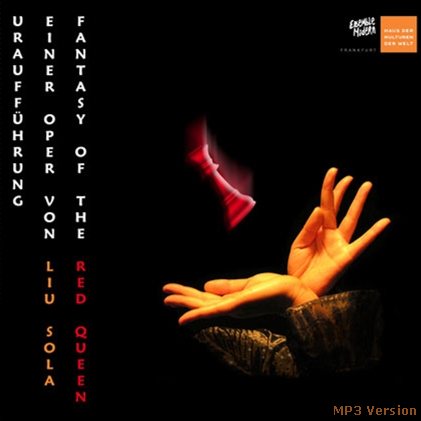 They opened shows with that 2001 theme song - Thus Spake Zarathustra [check out Live Album II live in Osaka, 1971], the one Elvis used. They imitated Cream's powerhouse trio lineup. They were much younger and muscular and macho. There was your likely answer. Grand Funk were a generation gap band between older rock fans and younger rock fans. Here is a show caught in that transitional time bubble in full flight as a pop rock band. Lengthy songs are banished in favor of crunchy rock star poses. The only survivors are the instrumental T.N.U.C. and the lengthy Inside Looking Out. Members of Wet Willie are said to have joined in on Loco-motion. In the end, Grand Funk never did understand credibility. They evolved and lost it. Grand Funk needn't have worried about record sales or empty halls. That wasn't a problem. They just didn't trust enough in themselves. Unlike say The New York Dolls who never sold many records or played in front of millions. The Dolls did what they wanted to do and nevermind their critics who said they couldn't play. At least the Dolls were influential. As far as we can tell, this show seems to be sourced from a circulating pro-shot video but said video has not had an official release. A boot DVD is on sale at some websites for US$12. This show was shared by anthony at Hunger City. Thanks. 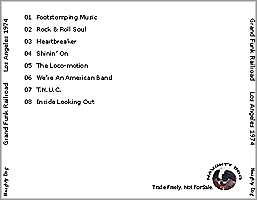 The "original" boot CD cover claims this show is "live in San Diego". As Grand Funk rolled on, their music became overproduced and slick. Live Album II is a show in Osaka in 1971 that captures a raw rock and roll power trio, still in control. Fans might like to track it down.